We are so fortunate to live in California, the weather has been amazing lately. Annoyingly so. Don’t get me wrong, warm sunny days are fantastic, but when it’s November I don’t want 83 degrees. I want jeans, sweaters, boots! Today it was chilly, windy and raining, awesome. Our afternoon was spent inside (shocking I had to sew) kiddo watching a movie, munching real popcorn (aka not microwaved) and my need to add a bit of Autumn decorations. 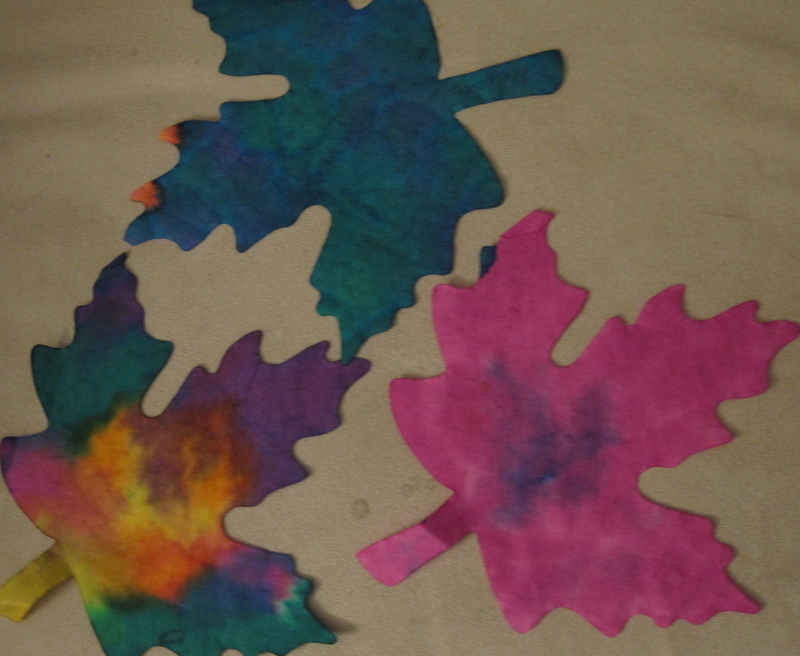 As you know, we glittered acorns the other day and Kiddo made these awesome leaves at pre-school. “Mommy, we need to display my leaves in my gallery.” Of course they needed to be displayed, but how? Think, think, think… taking down the last of the Halloween decorations this evening, I figured it out! I have a large simple black frame that had a spider web in it, and I thought there has to be a way to hang the leaves in the frame. Thread and tape! 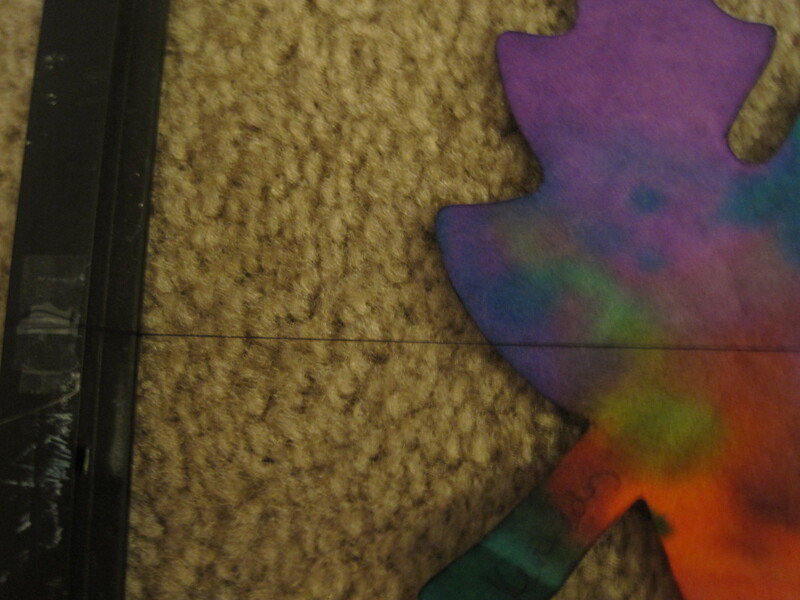 A little tape to hold the thread on the back of the frame, a bit of tape to hold leaf in place; how easy is that! It took about 5 minutes and looks perfect! I am sure there are many “better” ways to do this, but it got the job done and if I didn’t tell you how I did it, I don’t think you would guess thread and tape- would you? 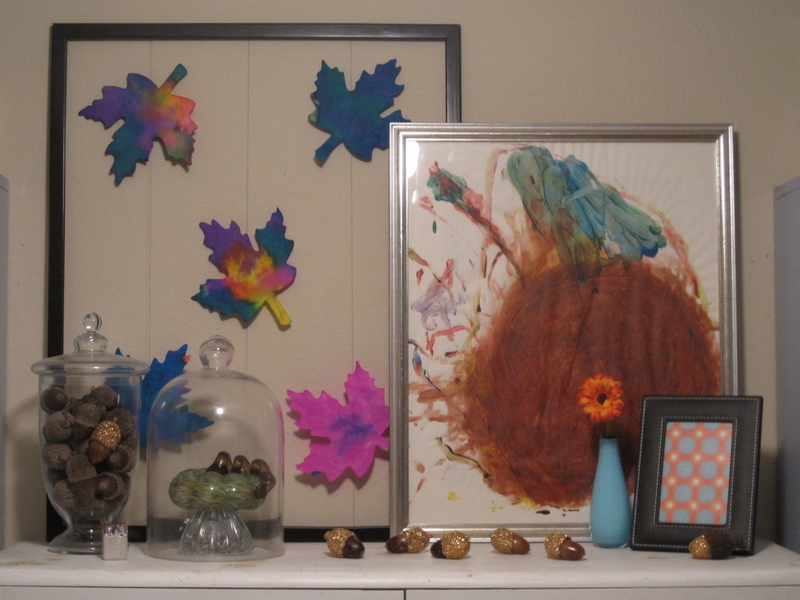 Pretty leaves, glitter acorns, an awesome turkey painting by kiddo (his head the small green blob on the left) and a piece of vintage orange and blue paper framed (thank you Ashley for mentioning that you did this today) brilliant! Now for a cup of tea and my evening work basket.